In spite of the relatively successful iPhone 4S launch, it was not without its problems, and similar to the ‘Antennagate‘ debacle of last year, there have been issues with the fundamental parts of the Apple’s latest device. This time, though, it has been a battery issue – with some folks complaining of 10%-per deterioration of their devices precious juice per hour. 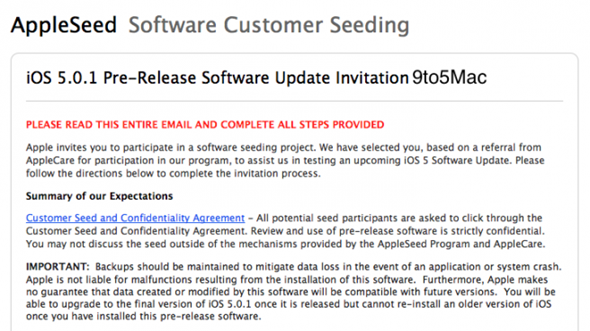 In order for the issue to be kept as low-key as possible, the Cupertino company has seeded the upcoming iOS 5.0.1 software (which is currently in its second beta) to select iPhone users who’ve complained directly about the issue in what is known as the AppleSeed program. The hastily-prepared update is thought to resolve the battery issue, allowing users to at least hold a one minute phone call before looking anxiously at the top right-and corner. Jokes aside, it must be of great relief to Apple’s PR department and iPhone 4S users alike that this appears to be a relatively minor, easily-fixed software compatibility issue, as opposed to the full-blown "here, take a free bumper!" scenario of 2010. There will also be the usual supplement of bug fixes, notibly improvements for Australian users of Siri as well as the multitasking gestures on the original iPad which – believe it or not – only came out last year. Seems as though we’ve never been without iPad, doesn’t it? 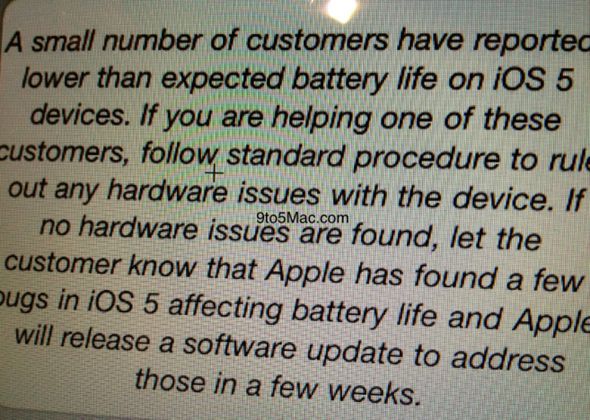 Additionally, Apple Stores have been issued with memos regarding how to deal with customers complaining about battery power (or lack thereof). Staff have been told not to replace phones with battery issues, and in turn will advise customers to hang on for a few weeks whilst Apple prepares the software to rectify the problem once and for all. In short, if your battery doesn’t work, you’re going to have to build a bridge and get over it! It was thought with the much-improved battery life of the iPhone 4 that Tim Cook’s company was past any battery issues, but recent events have suggested otherwise. 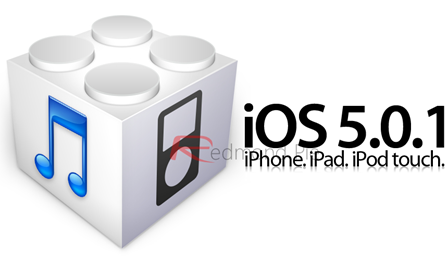 It would certainly hinder what is a solid device if the problems were to persist past 5.0.1. We’ve no word yet on the release date, although as Apple has internally revealed, it could be a little while yet. To make it very clear, iOS 5.0.1 will drop in the coming weeks, and is not available for download just yet for everyone. We’ll have the info here first once it does drop, so stay tuned!